As the weather gets colder and the excitement rises for Christmas break, many Penn Manor families start their annual holiday traditions. “Christmas makes me feel like I’m floatin’ on a cloud,” said Mickayla Baldwin , whose family has a very unique tradition. Her family plays a game called Polyanna. 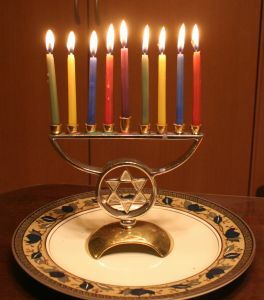 Hannukkah is celebrated December 1 - 9 this year. This is a very popular holiday tradition in the United States. Caitlin Whirt, a senior at Penn Manor shares her family tradition of putting pictures in front of their decorated Christmas tree. Also, Caitlin said that her family always gets together for the holidays at her house. Here at Penn Manor High School, Christmas is just one of the many holidays celebrated among the student body. Hannakuh, a Jewish holiday is celebrated as well. Making Christmas cookies is a popular holiday tradition. Along with gift and family dinners, holiday songs are another very popular tradition when the holidays are approaching. Christmas music originated in England where traveling musicians would visit towns and sing Christmas songs for the holidays. In today’s society, we still go door to door and sing carols for all to hear. “My favorite Christmas song has to be “Carol of the Bell,'” said Cassie Kreider a Christmas loving Penn Manor freshman. Mickayla Baldwin another freshman says that her favorite song is “Oh Come All Ye Faithful,” an old Christmas carol written by John Francis Wade that first appeared 1751. Brian Geer, a junior at Penn Manor tells us that his favorite Christmas Carol is “Silent Night.” The song has been translated into more languages then any other Christmas song. Whether it’s listening to Christmas music, or getting presents at family reunions, most families have their own special holiday traditions.